VIRAC, Catanduanes (Bicol Standard)--Police Chief Inspector Max Jim R. Tria of this province, who is known as the "Last Man Standing" in the Mamasapano clash, was honored during his third year death anniversary at Catanduanes State University this morning. 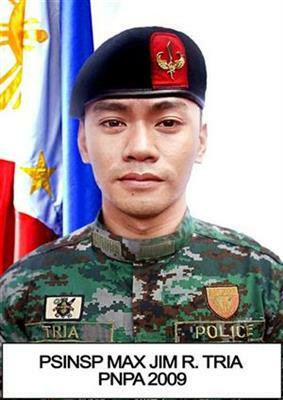 Tria was a member of the elite unit of the Philippine National Police(PNP), Special Action Force (SAF), and was among those killed in the bloody encounter. He took his elementary and secondary education at the Catanduanes State Colleges(CSC) now CSU from June 1994 to March 2005, according to Edna Bagadiong of the Philippine Information Agency. Tria had been with the PNP since 2005. He was a PNPA graduate of BS Public Safety. Invited in the occasion were Gov. Joseph Cua, Cong. Cesar Sarmiento, Mayor Samuel Laynes, PSSupt. Felix Servita, and relatives of the late cop.